↑ Landau, Elizabeth (March 12, 2010). "On Pi Day, one number 'reeks of mystery'", CNN. Retrieved on March 14, 2010, from http://www.cnn.com/2010/TECH/03/12/pi.day.math/index.html. ↑ Bellos, Alex (March 14, 2015). "Pi Day 2015: a sweet treat for maths fans". theguardian.com. สืบค้นเมื่อ March 14, 2016. 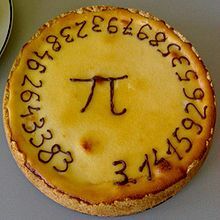 ↑ "Pi Approximation Day is celebrated today". Today In History. Verizon Foundation. สืบค้นเมื่อ January 30, 2011. หน้านี้แก้ไขล่าสุดเมื่อวันที่ 14 มีนาคม 2561 เวลา 13:09 น.